The most impressive feature of the Casa Grande Ruins is the four-story caliche structure, built some 650 years ago. 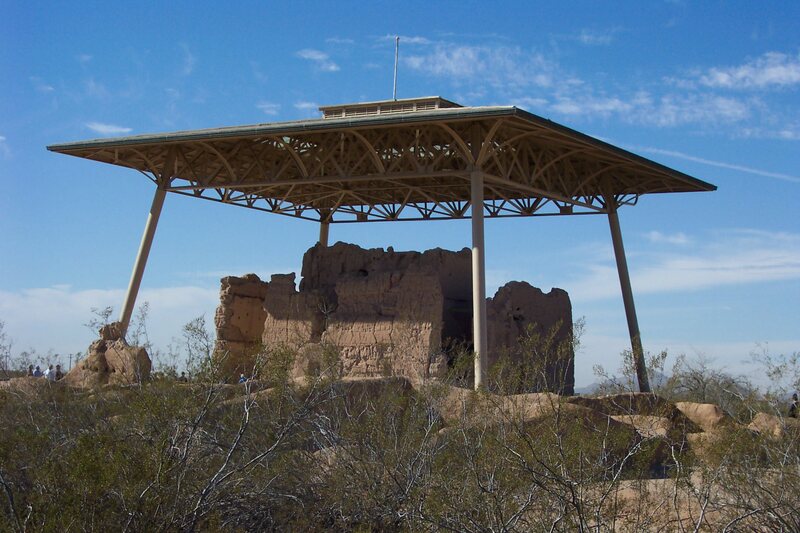 Now protected by a concrete-and-steel canopy, it's purpose in the Hohokam culture has never been determined. The Hohokams flourished for 1,000 years in the Sonoran Desert and have left behind tantalyzing clues of their existence. By the time European settlers arrived in the area, all that remained of this ancient culture were the ruins of buildings, canals, and various artifacts. Indian ruins, folks. That's what we're talking here. 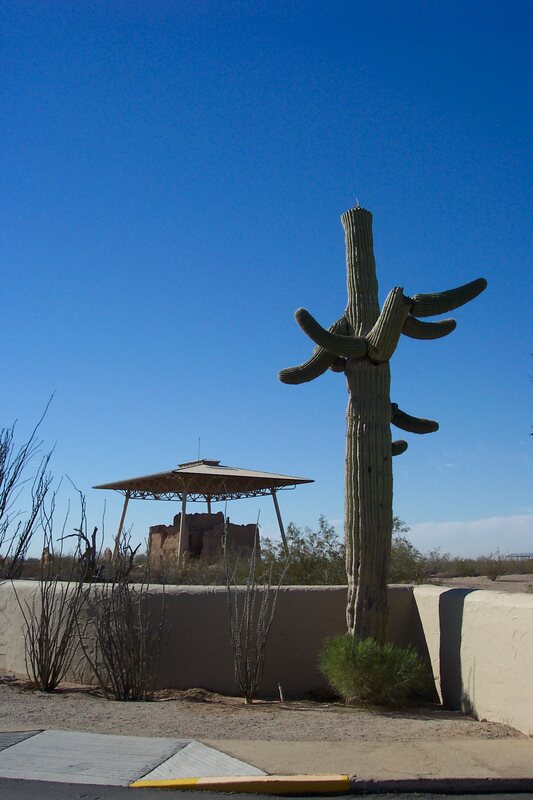 The Park sits on the flat Sonoran Desert, surrounded by tumbleweed and palo verde trees. The heat can be brutal in summer, so plan accordingly. Most of the Park consists of old walls, two or three feet high, the outline of rooms that fell apart hundreds of years ago. You are allowed to walk around those ruins and imagine what it must have been like 700 years ago. 45 minutes will be enough for most families, especially as visitors aren't allowed near the most impressive of the remaining ruins. 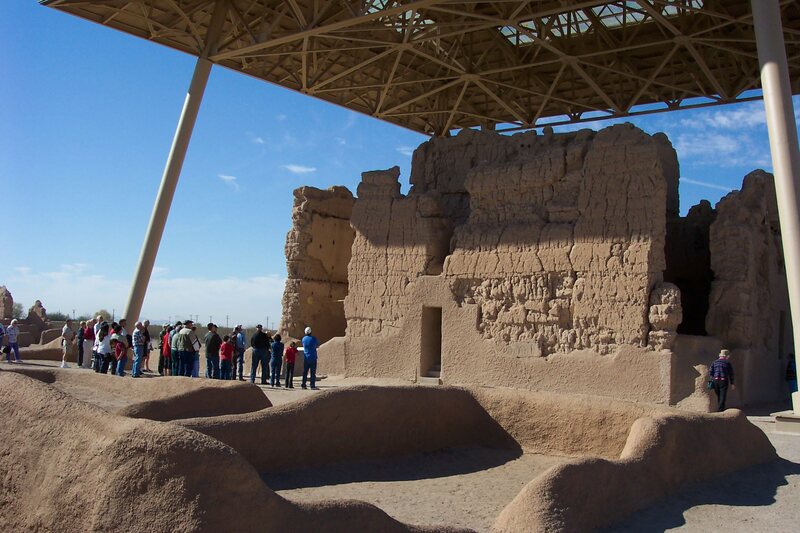 The most striking feature of the Casa Grande Ruins is, unfortunately, the protective roof that was installed 70 years ago to help preserve the caliche structure. It towers over the four-story Hohokam building, to protect it from destructive rainfall, I suppose. At least it provides some shade as we follow the Park guide on a tour. Visitors aren't allowed to actually touch the main building; vandals and too-curious visitors have taken their toll over the years. The kids weren't too thrilled with the Visitors Center, and truthfully I couldn't blame them. There were pottery exhibits and examples of tools the Hohokams used, there were drawings of how the center might have looked 700 years ago. But that's not much to hold their interest. 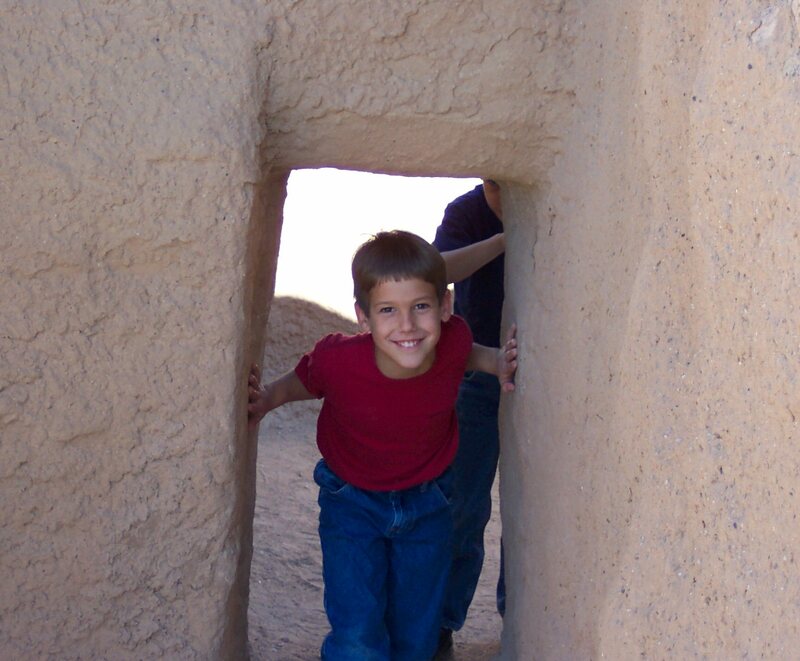 They had more fun running around outside along the paths where visitors are allowed, looking through holes, hiding behind short walls of other structures just to the south of the main building. BUT -- The Visitors Center does have a stamp for your Passport, and isn't that what this website is really all about? From Phoenix, take I-10 south to exit 185. Take highway 387 east about ten miles. Turn right on Skousen and go one mile before turning left onto Vah Ki Inn Rd. Go east a mile and turn left onto Monument Drive, then follow the signs to the Monument. From Tucson, go north on I-10 to exit 211. Take highway 87 north to Coolidge for 18 miles, and turn left on Vah Ki Inn Rd. After one mile turn right on Monument Drive and follow the signs to the Monument. To the west is Hohokam-Pima National Monument. 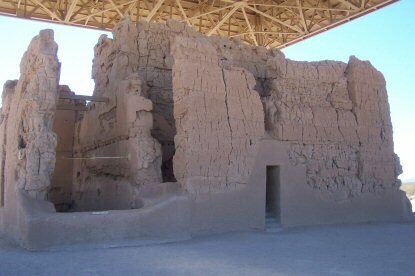 About 80 miles north is Agua Fria National Monument. About 40 miles northeast is Tonto National Monument. 50 miles to the southeast lies Saguaro National Park, and about 95 miles to the south is Tumacacori National Historic Park. 90 miles to the southwest is Organ Pipe Cactus National Monument. Visited December 2001, January 2004, June 2007, and July 2009.